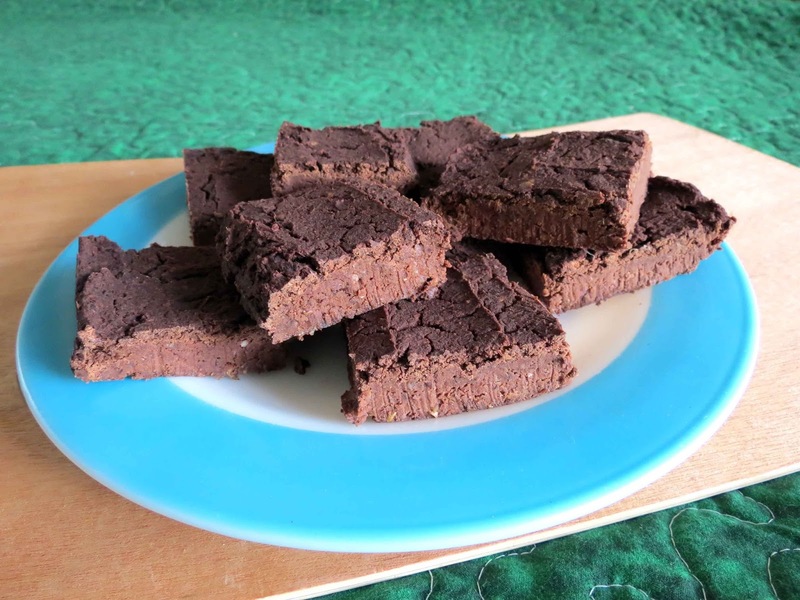 Based on Dr. Joel Fuhrman's Eat-to-Live recipe, this fudgy brownie recipe has no oil, white sugar or flour. These brownies taste so good, even people who aren't used to eating whole foods can enjoy them. Combine black beans, dates, almond butter and vanilla in food processor or high powered blender. Blend until smooth. Add cocoa powder and chia seeds and process to combine all ingredients. Spread into 8" x 8" baking pan lined with parchment paper. Bake 1 1/2 hours at 200 f or 30 minutes at 350 f.
*If using canned beans, open two cans of beans, rinse and drain. Measure out two cups for the recipe and store the remaining beans in the fridge to use on salads. Notes: If the mixture gets too thick to blend in the processor, try adding a small amount of water (up to 1/4 cup) or transfer to a large bowl and mix with a spoon. When dates are too expensive, I substitute raisins for the dates, but dates taste sweeter. Double the recipe and bake in a 9" x 13" baking dish, at 350 f about 35 minutes. Check Out My Sister's New Website - VEGAN and CRUELTY-FREE Bath and Body Products! Link List. Awesome Inc. theme. Powered by Blogger.